Bob Evans Restaurants providing homestyle food and friendly service. Bob Evans has something for everyone at breakfast, lunch and dinner. 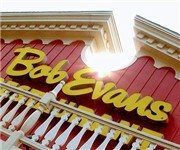 How Would You Rate Bob Evans Restaurant?